The first streaming box to offer all three Aussie SVOD platforms, the Telstra TV has a unique selling point, but the implementation leaves a lot to be desired. The biggest promise of the Telstra TV is a unified big-screen platform for all of Australia's video streaming services. Since the arrival of Netflix and Stan, users have had to cobble together a variety of streaming and beaming solutions to watch all three services on a television. The main holdout was Presto – While Netflix is available on everything and Stan has slowly made its way to both the Apple TV and now Sony's PS4 and PS3 consoles, Presto was initially stuck on web browsers, tablets and phones since launch. When the Telstra TV was announced, that all changed. Starting with the Telstra TV (and quickly followed by apps on Playstation devices), Presto became easily accessible on the big screen. Unfortunately, Presto's foray onto home televisions didn't last long, with the streaming service shutting down at the end of 2016. And while the Aussie SVOD apps are available on both Sony consoles and the Telstra TV, catch up TV is another matter entirely. The launch of Tenplay and ABC iview in the tail end of 2015 means that the Telstra branded Roku box is the only way you can access all of Australia's SVOD and catch up services in one place. Telstra has since expanded the app lineup with relatively new additions NRL, AFL and Fox Sports, giving Australian sport lovers a fairly wide selection of options to choose from. But it's that combination of the holy trinity of Australian SVOD services that is undoubtedly the platform's biggest selling point, but it has come at a cost. While the Telstra TV is essentially a rebranded Roku 2, Telstra has taken a virtual hacksaw to the software in order to make it a truly Telstra device. And make no mistake, that plays a big part in our final verdict of the platform. In a market that has Apple opening its successful (and historically closed) Apple TV platform up to developers, Telstra's decision to essentially lock down what is a fairly open platform in its natural state is a definite frustration. But more on that later. Given that the Telstra TV is essentially a rebadged Roku 2, the hardware is anything but a surprise. It's still a small squarish box with a weird purple clothing tag coming out the side, plus USB, ethernet, SD card and HDMI ports around the back (and side). But this time around, instead of saying Roku on the front and remote, it says Telstra TV, and those little cloth tags read "Roku powered". The puck is deceptively lightweight - not that you'll notice once it's tethered to your TV – and at 88.9 x 88.9 x 25.4mm it's small enough that it can comfortably rest underneath a TV on a stand. It's quiet, and doesn't seem to generate a huge amount of heat, so you could potentially stack it next to a games console without fear of burning the house down. 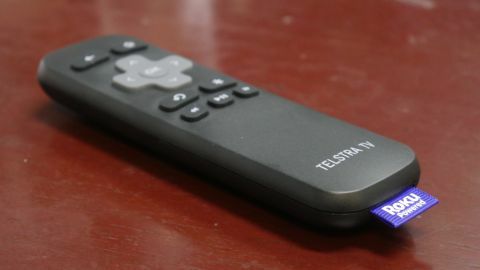 There are no physical buttons on the device to speak of – the Telstra TV instead sits in standby mode while waiting for a signal from your remote. Integrated Wireless N means you can comfortably rely on a wireless connection to stream your favourite shows, but if you really want the best possible connection you're going to take advantage of that ethernet port in the back. The remote itself is a compact, no frills affair. The shortcut buttons to your favourite streaming services found on the Roku 2 are gone – not replaced with local services, simply removed from action. This is a shame, really. While the selection is obviously different over here, having shortcut buttons to Australia's SVOD platforms would be a keen differentiator for the Telstra TV. But where the Telstra TV truly differentiates itself from Roku is in the software. Unfortunately, it's not by opening up the Telstra TV to a whole range of content, but by locking it down to a much more restricted collection of apps and services. The HDMI port on the back will pump out 1080p video streams. While it's not the 4K streams we want (that you can get in the US in the Roku 4), it's still on par with almost every other streaming device in Australia, so we can't mark it down too much. Setting up the Telstra TV is a relatively straightforward affair, although it's worth noting that you will need a Telstra account ID to get things up and running. You can probably make your way around this restriction by picking up a cheap Telstra pre-paid SIM, creating an account and then activating the streaming box, although we can't say for certain this will work as we used our own Telstra account to get started. Once you switch the Telstra TV on, you'll be prompted to connect to a Wi-Fi network (if you're not using that ethernet jack), and the box will then pull down the latest firmware before the installation carries on. You'll be prompted to add your timezone information, then you have to agree to the device's terms. For those who like to speed through the T&Cs without actually reading what they're agreeing to, you'll hate the fact that scrolling through the terms with the Telstra TV remote takes ages. Contract signed, the Telstra TV box will download its "pre-installed" apps (Stan and Netflix, plus a few more), before then requiring you to activate the box with your Telstra account. To do this, you'll need a web browser and a Telstra account. The Telstra TV will generate a code with a 30 minute refresh rate that you need to enter on a dedicated activation page. It's a slightly roundabout process, but you only have to go through it once, so it's an acceptable compromise. Once activated, the box will give you three simple control tips, before updating those apps it only just downloaded - or maybe it's the ones that were already there? It's not really clear, but there's definitely more downloading going on before you can start streaming. The whole process takes about 15 minutes, so it's not a massively laborious process. But it's not fun either.